Stir in old-fashioned oats for chewier cookies, along with a dash of ground cinnamon or ginger for a bit of spice. Planning for future baking? Stir up the dough and freeze it in an airtight container for up to 9 months. Thaw the dough just until soft enough to scoop. Time saver alert: make the dough up to 24 hours ahead, cover it, and refrigerate till you’re ready to bake. If too firm to scoop, let it stand at room temperature for about 30 minutes. There’s enough butter in the recipe to keep them from sticking on the baking sheet, but for easier clean-up use a sheet of parchment paper to line the pan. You can re-use the parchment several times. Oatmeal chocolate chip cookies are one of the most popular culinary variations of the classic chocolate chip cookie. 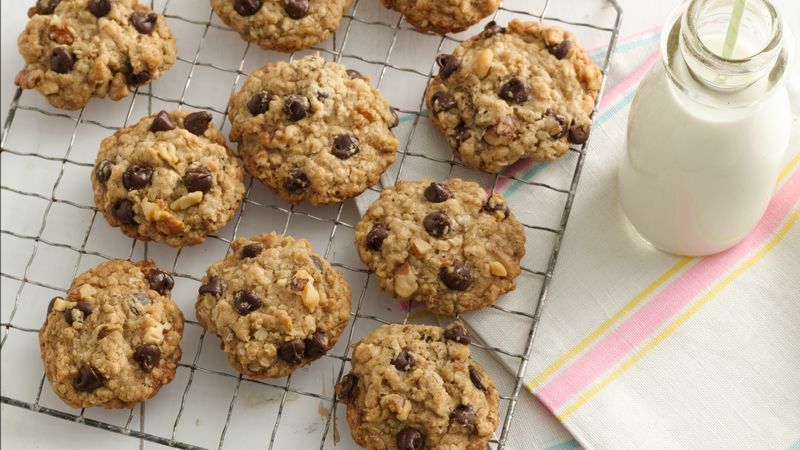 This from-scratch recipe includes whole-grain natural oats and semisweet chocolate chips for a two-in-one taste treat. When family and friends get a taste of the gooey chocolate and oats in this cookie, it’s sure to be an instant hit—so be prepared to make this recipe again and again. Now that you’ve got a box of oats and a bag of chocolate chips in the pantry, you might be ready explore some variations on this irresistible combination. Check out Betty’s best oatmeal chocolate chip cookies to find creative new twists and time-tested heirloom favorites.